Over 100 peer-reviewed studies about Reiki, Therapeutic Touch and all other forms of shamanic healing are discussed to provide you with the most scientific guide to energy healing ever! 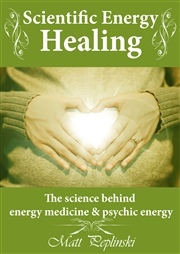 After reading this book, you'll understand how and why energy healing works and be able to heal people with your hands. At age 13, he experienced his first panic attack and was told by his new-age parents to heal himself. They refused to take him to a doctor or therapist, so from that point on, he tried every self-help technique and book available. But nothing helped. It only made his mental issues worse. Eventually rendering him catatonic for over a year. After he recovered from catatonia, Matt began studying psychology. After graduating he devoted his life to giving practical, evidence-based self -help advice to people who are experiencing similar issues he had and to researching the science behind alternative medicine.